Retired rugby league star Luke Lewis doesn't believe further punishment is the answer to the spate of players charged with violence against women. Lewis has done a lot of work with the White Ribbon Foundation after witnessing first-hand the damage violence against women causes. Deeply disappointed by recent headlines concerning NRL players, he is sick of the game being dragged through the mud. "It's always disappointing, because it's our game, we all love it and hate to see it in a shambles, but I don't know the details of these recent cases," Lewis tells ESPN. "I don't really know what the long-term answers are, but we can't keep going to harsher punishments. At the end of the day when someone does something wrong they are dealt with by the police. We can't have them facing the club, the NRL and the police. They have to be dealt with the same way as every other member of society is dealt with. Being handed $200,000 fines by clubs is ridiculous. "I don't have an answer for it, I wish I did, I know the boys get educated a lot, I know they do a lot of work away from footy with communities. "When you look across all the clubs though, one thing I notice is that you never see Melbourne players getting into this kind of trouble. It just must be the core values that Craig Bellamy gets all his players to buy into and none of them want to let their teammates or club down." Lewis retired from rugby league at the end of the 2018 season after a first grade career which spanned 18 years and included 324 games, 17 State of Origin appearances and 16 Tests for Australia. He has written a book about his life titled "Cool Hand Luke Lewis" in which he describes his childhood, his passion for rugby league and determination to make it as a professional player. It follows the highs and lows of a remarkable career, through injuries, a cancer scare, a heart-breaking split with his beloved Panthers and two premiership victories. 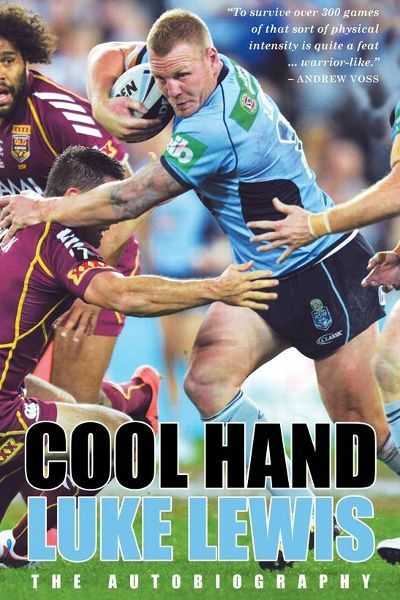 "Cool Hand Luke Lewis" - autobiography. In the 110-year history of professional rugby league in Australia, only 33 players have managed to play over 300 games at the top level. Rugby league is arguably the most physically punishing ball sport in the world, and injuries cut many great careers short of the milestone. There is also the constant influx of the next generation of star footballer, looking to push the aging champions towards early retirement. It takes a special blend of skill, toughness, adaptability, guile and a mountain of hard work to build a 300-game NRL career. Of the 33 players to reach 300, 12 were single club players, something Lewis thought he would be when he signed his first contract with Penrith Panthers as a 17-year-old. In 2012 after eleven years of first grade at the club, management were hesitant in offering him a new contract and he sensed the relationship was nearing an end. He was initially disappointed, but after signing with the Sharks, his mantra that everything happens for a reason strengthened his resolve to make the most of the move to the Shire. "I don't think I would have been disappointed with my career had I finished with the one premiership with the Panthers, but I signed with the Sharks with a dream of being part of their first premiership win, so it was great that we won," Lewis tells ESPN. Raised in Sydney's western suburbs by his mum, Lewis enjoyed a childhood that included a daily diet of outdoor activities with mates. It was the storied suburban upbringing where each day ended when the street lights came on, signalling to all the standard parental curfew. Weekends were full of organised sports, where a love of rugby league grew inside Lewis from a young age. "I was really obsessed with it. When I came home from school I'd grab the football. I'd carry a football around in a backpack, we were always kicking it around the backyard, trying to kick it into a basketball hoop, things like that. We even played cricket using a football," Lewis tells ESPN. "I was never the most talented player, but I was always working hard to improve. Brad Izzard coached me in Penrith juniors and he told me that I had to put in extra work to get ahead of the next guy that wanted to play first grade. I took that to heart and I basically trained every day. Even now I still get up and go for a five kilometre run on Christmas Day." Lewis decided he was going to make a career out of rugby league and set about doing everything he could to make it a reality. After working his way through the junior representative teams and a near signing with the Roosters, Lewis made his first grade debut for the Panthers in 2001. Two years later he was part of Penrith's second-ever premiership winning team, he toured with the Kangaroos and was selected for New South Wales the following year. What followed was a tough period of his life, with shoulder injuries, a fortunate scan which detected early a cancer on his thyroid gland, and a lot less on-field success. It would take Lewis another five years and a move from the backs into the forwards before he would pull on another New South Wales jersey and make his debut Test appearance for Australia. He found a new love for the game after his move to the forwards, where all the action happens. His ability in defence, his hard hole running and unbelievable work-rate made him a perfect back-rower. He was starring from his club. state and country, but the Panthers had salary cap issues and Lewis asked for a release, sensing the inevitable. Not long after he landed at the Sharks, ASADA launched its investigation into illegal use of supplements at the club. There followed three tough years, before the 2016 season saw Cronulla break its premiership duck, with Lewis winning the Churchill Medal for best player in the grand final victory over Melbourne Storm. Two seasons later, during a recovery session, he realised he'd rather be doing something else. His body, kept moving through a cocktail of anti-inflammatory and arthritis medications, had had enough. He knew it was time. He announced his retirement from the game he had loved and given so much of his life to. He left the Sharks along with several other big name players, including Valentine Holmes, Jesse Ramien, Edrick Lee and Ricky Leutele, but thinks they are still well-positioned to compete for the title in 2019. "The Sharks are in good hands, they still have Matt Moylan, Josh Morris has played a lot of football for Australia and at Origin level, he'll have his career revamped by moving over to Cronulla, they have Josh Dugan, Sione Katoa, Sosaia Feki and they have Shaun Johnson in the halves as well," Lewis tells ESPN. "They've got a really good backline, they have some really good young kids coming through, and they're really classy all across the park. I'm still expecting the Sharks to be a top four team and have a red-hot crack at the premiership." Cool Hand Luke Lewis can be purchased from bookstores or online at www.newhollandpublishers.com.